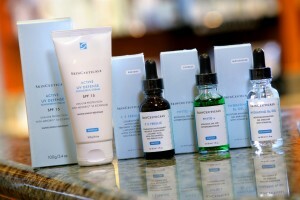 SkinCeuticals is the preferred skin care line of Spa Costa Del Sur because of their mission to improve skin health. Born from decades of skin cancer research that led to pivotal breakthroughs in antioxidants, their high potency formulas are concentrated in pure actives and proven to penetrate optimally into skin. At SkinCeuticals, skin health is the first priority, and we feel it’s our responsibility to share our valuable knowledge and resources with the world. They support several key causes that further skin science research, promote skin health awareness, and demonstrate a commitment to skincare safety, as well as environmental awareness. Made in the USA, their clinical skincare is used by dermatologists, plastic surgeons, and medi-spas for daily homecare and to complement aesthetic procedures. They formulate to correct signs of aging, protect healthy skin, and prevent future damage. SkinCeuticals is committed to the highest, medical-grade formulation standards, and uses only pharmaceutical-grade ingredients. They subject the final formulations to extensive clinical testing that proves they deliver on their claims. Their products are produced in small batches and packaged under closely monitored, sterile conditions to ensure optimal potency and freshness. The SkinCeuticals story started long before the company’s founding in 1994 thanks to the pivotal research performed by Dr. Sheldon Pinnell. In the years since, they have continued to pave the way with breakthroughs that have changed the face of skin science.